Sweet and savory Roast Pork (Thit Xa Xiu) is a must-have and must-know recipe for all Asian food lovers. Roast pork is used as an ingredient in many Asian dishes from stir-fries and noodle soups to sandwiches and steamed buns. 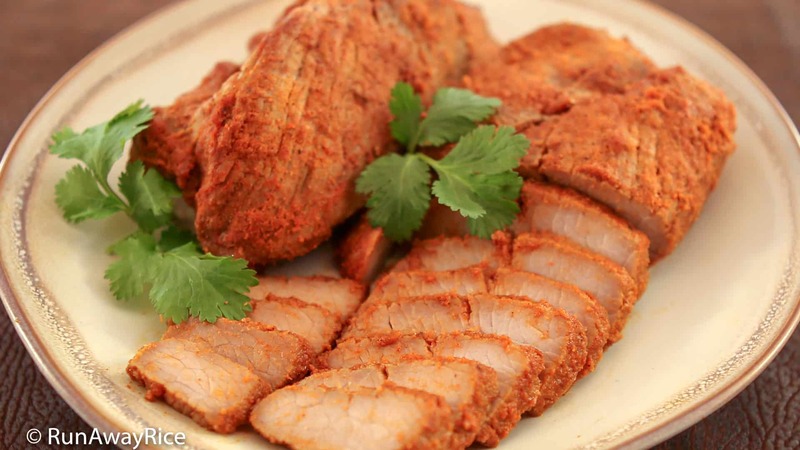 Learn this easy Roast Pork (Thit Xa Xiu) recipe and you have a healthy alternative to the store-bought seasoning mix. Did you know some seasoning mixes contain wheat? Yes, it’s from the soy sauce powder. Try this wheat-free marinade which also has less sugar and no red food coloring. Pork not your favorite? This recipe works well with chicken too. The process is the same but use a meat thermometer and check the recommended cooking guidelines. Cut the pork into smaller pieces, about 6 inches long by 3 inches thick. Mix all dry spices in a measuring cup. Add the tamari/soy sauce, water, sake/rice wine, honey and sesame oil. Stir the marinade until well-blended. Put the pork in a plastic sealable bag and pour in the marinade. Seal the bag and then work it with your hands to evenly distribute the marinade. Refrigerate for 1 hour. Pour the rice vinegar into a 9 inch by 13 inch baking dish. Add enough water to cover the bottom of the baking dish, no more than 1/4 inch high. Insert the roasting tray. Place the pork pieces on top of the roasting tray allowing room between each pork piece. Cover the dish with foil and seal well. Bake for 20-25 minutes or until the internal temperature is 145-150 F (60-63 C). Remove from the oven and unwrap the foil. Be careful as there is steam inside. Allow the meat to rest for a few minutes before slicing and serving.